satellite tv | Value Investing In KLSE>Value Investing Made Easy! DISH Network Corporation provides satellite delivered digital television services in the United States. It offers direct broadcast satellite subscription television services, as well as provides video, audio and data channels, interactive television channels, digital video recording, high definition (HD) television, international programming, and professional installation services. The company designs and develops DBS receivers, antennae, and other digital equipment. It also designs, develops, and distributes equipment for international satellite service providers, as well as offers receiver systems and HD receivers. As of December 31, 2007, the company had 11 owned or leased in-orbit satellites; and offered 2,700 video and audio channels to consumers. DISH Network Corporation offers its products and services through satellite retailers, direct marketing groups, consumer electronics stores, nationwide retailers, and telecommunications providers. The company was founded in 1980. It was formerly known as EchoStar Communications Corporation and changed its name to DISH Network Corporation in January 2008. 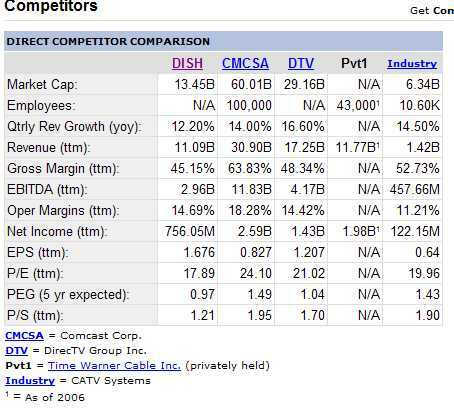 DISH Network Corporation is headquartered in Englewood, Colorado. While for years DISH Network has used standard MPEG-2 for broadcasting, the addition of bandwidth-intensive HDTV in a limited-bandwidth world has called for a change to an H.264/MPEG4 AVC system. DISH Network announced as of 1 February 2006, that all new HDTV channels would be available in H.264 format only, while maintaining the current lineup as MPEG-2. DISH Network intends to eventually convert the entire platform to H.264 in order to provide more channels to subscribers. Both a standard receiver and a receiver with built-in DVR (Digital Video Recorder) are available to subscribers. The Dish Network ViP622 HD DVR has received good reviews from CNET and others. Both a standard receiver and a DVR (Digital Video Recorder) are available to subscribers for an upgrade fee. Currently Dish Network charges $5.98 per DVR as DVR service fee, which covers cost of licensing EEPG(Extended Electronic Program Guide) from TV Guide. From Dish Network,we can see that Astro may implement these technologies in Malaysia,Indonesia,India,Brunei and China in the future.